Hi, it's Chris again, back to talk about managing anxiety in kids. In my last post I talked about how anxiety can affect our students. It's important to remember that anxiety is silent too--you may not see it creep up until the child melts down and then it might seem out of the blue. For some students, staying in a stressful situation too long an hour ago can make the mistake he or she made on his paper just now (a silly little problem) seem much bigger. This is hard to remember as we push students to extend their boundaries and do new things. Balance is always the most important thing to strive for. So, having begun to teach students how to identify when they feel stress, the next step is to help them figure out what to do about it. Some of that is up to us and things we can put in place. Some are skills we need to teach them to cope with stress. I would say coping with stress is a huge life skill for all students; some individuals just need more help with it than others. Disclosure: I have provided Amazon and Autism Asperger Publishing Company links below for your convenience. 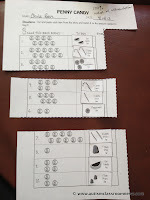 I've also embedded pins from my Pinterest boards to share pictures of strategies so that if you click on them you will find the pin on my board and then it will take you to the source. This might mean adjustments to the schedule so that he or she leaves the activity before becoming overwhelmed. You want to be careful that you don't keep a student in an activity until he becomes anxious because the anxiety and / or the meltdown will be reinforced when he has to be removed. So, figure out about how long he/she can manage in the activity successfully and have him scheduled to stay for slightly less than that amount of time. Adapting the schedule might also mean starting his or her day off with a preferred activity or a calming activity to help start the day off calmly. A student may be able to participate in an activity for the full length of time if the work is adapted. Clearly this is a balancing act of making sure that there is academic rigor balanced with the relief of anxiety. However, this is a great proactive strategy to use while you are teaching him or her to manage the anxiety and reduce it in other ways. Keep in mind that telling a student who is overwhelmed by the work that he only has to do part of it, may not lessen his anxiety if he still sees the whole thing. It may be helpful to break down the task and only show part of it to the student to prevent him from becoming overwhelmed. 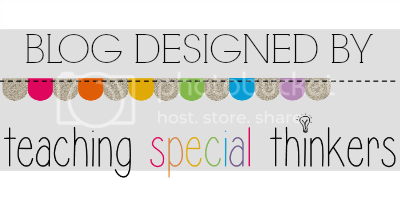 This post from my blog might give you some ideas for that. Don't discount the feelings of anxiety. They are very real. Think about the times in your life when you have gotten really scared or worried about something--a big job interview, your wedding, meeting your future inlaws for the first time, or your first date with a new person. Did people telling you not to be worried really ease your anxiety? Most likely what helped reduce your anxiety was a friend or family member who sympathized and recognized your feelings while still staying positive about your ability to deal with them. We live in a society where it's considered weak to show signs of anxiety so we tend to minimize it. We also don't always know how to respond to it, so we tend to play it down to avoid it. But anxiety is a real thing that people experience. Some people experience it more than others and for some it becomes disabling. Minimizing it doesn't reduce that problem. So, acknowledge that the child is feeling anxious (e.g., "I know you are feeling overwhelmed right now. What can I do to help you stay calm?"). This is a great book by Anne Chalfant in which she provides a lot of great information about ways to handle anxiety in individuals with autism, but it is relevant to everyone. One of the things that she stresses that I really love is emphasizing bravery. Talk about how a child is being brave when he or she is trying something new or doing something that increases anxiety. Focus on the positive and choose your words in such a way that you are emphasizing confidence and presuming competence for the person. Talk about bravery and what it means. This is a terrific book that has been a great resource for how to adapt the environment and also how to teach skills like progressive relaxation and other stress management skills. One tool that I've used very successfully in the past is a workbook designed for children called When My Worries Get Too Big! : A Relaxation Book for Children who Live with Anxiety Revised and Expanded Second Edition - Now With Teaching Activities! by Kari Dunn Buron. 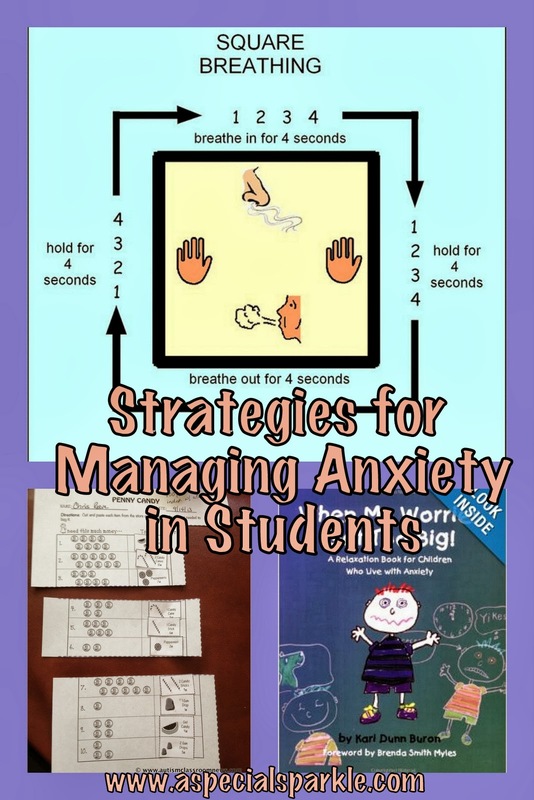 This is an awesome book that takes students through a variety of ways that they can identify when their anxiety is getting too high and then helps them identify ways that they can reduce it. The book just had a recent revision to the 2nd edition and it is expanded to include even more activities for the children to complete. It works kind of like a Social Story in that it takes the child through a variety of ways to both identify stressful feelings and determining coping strategies. It can be used with The Incredible 5-Point Scale I talked about in the last post. Go ahead--take a deep breath. Now take another one. And one more. There, doesn't that feel better? One of the most common methods for relaxing is to regulate our breathing and we often stop and do this by taking deep breaths. This is a great skill for students to learn, but it is hard for some of them given the sensory issues and the difficulty with motor planning. Ask some students to take deep breaths and they hyperventilate. Here are some strategies to help them learn to be effective with deep breathing. Use visuals. This visual for Square Breathing is just a way to help children slow their breathing down and is really effective at getting them to understand better what deep breathing looks and feels like. Have them stand and raise their hands when breathing in and lower hands when breathing out, much like you might do in exercise class. Have them put their hand on their abdomen to feel its movement when the breath goes in and out. Remember that first you have to teach the skill so the student becomes proficient at it when he or she is calm before it can be cued and used in stressful situations. 6. Teach Progressive Muscle Relaxation or other relaxation routines. Like deep breathing, relaxation strategies are something that have to be taught when the child is calm and then it can be cued when needed. It is also something that can be programmed into the child's schedule to help try to maintain calm. There are lots of great resources out there these days to teach relaxation to kids from Yoga to mindfulness to progressive relaxation. Here are a few resources you might find interesting or useful. This book is a great resource for teaching progressive muscle relaxation to students with ASD from the Groden Center. It uses visual supports and walks you through the teaching process. These are visuals for teaching progressive muscle relaxation from the Geneva Centre for Autism (click the picture to go to source). This is a page with a set of routines for teaching relaxation through imagery including the steam engine, tea kettle, and Spiderman. 7. Provide visual choices or reminders. These visuals provide information and reminders to a student about what to do when he or she starts to get frustrated or stressed. This is also from the Geneva Centre for Autism. Both can be accessed by clicking on the picture and downloading from their site.